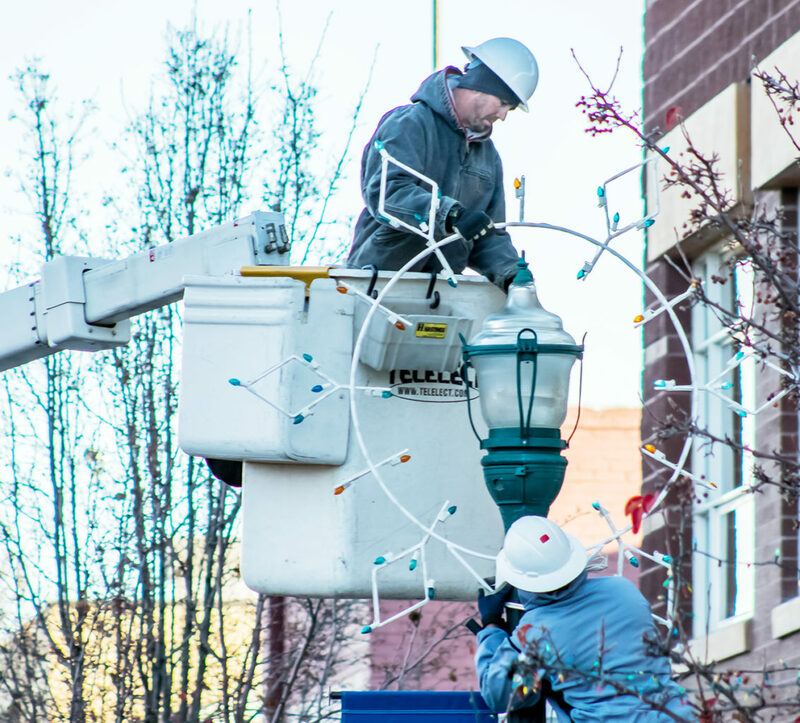 Manti City electricians Casey Johnson (above) and Kenny Keller prepare Main Street for the city’s eagerly festive post-Thanksgiving Day annual Christmas Light Parade by hanging glowing snowflake decorations up and down a large stretch of the main thoroughfare. During the holidays, everything has a twinkle to it, with light parades, fireworks, and Christmas trees and houses lit up for the holidays. Right out of the gate this season, things are getting festive quick in all across the county, with some popular events in Manti, Gunnison, Mt. Pleasant all planned for this week. In the Gunnison Valley, Gunnison City isn’t wasting any time with their celebrations—especially their big day, which takes place on Saturday, Nov. 25. The annual Gunnison Valley Santa Run 5K is being hosted again by the Gunnison Valley High School Student Body Officers. Check in for the run is at 9 a.m. and the race gets going at 10 a.m. The cost to run is a donation of $15 towards a Gunnison Valley Area Sub for Santa program. A free movie is up for the taking from 1-3p.m., compliments of the Casino Star Theatre. The Legacy Plaza will be home to a handful of activities from 4:30-5:30 p.m. Freedom Ford and Gunnison Implement Company will both be doing major giveaways. The annual plaza tree lighting will also take place. Manti Tomorrow, Manti City has its annual light parade scheduled for 6 p.m. Floats, trucks, trailers, cars, buggies, tractors and more are adorned with glowing lights and cruise down Main Street. After the parade, festive parade go-ers can enjoy food, entertainment and a visit from Santa at Manti High School right after the light parade. In Mt. Pleasant, they like to keep their Christmas old school, hosting their yearly “Old Fashioned Christmas” on Saturday, Nov. 25 at 6:30 p.m. on Main Street. As attendees lined up with their kids to see Mr. and Ms. Claus, who never miss the occasion, wood fires burn in nearby metal barrels where people get warm in the frosty air. Mt. Pleasant Elementary School students will offer entertainment, while kids and adults can both take free wagon rides. There will be games and prizes for the children. Scones, chili and hot chocolate will all be available. On, Monday, Nov. 27, Mt. Pleasant Historical Association is hosting a display of pioneer adaptions of ancestral Christmas traditions, 5-8 p.m. at the Pioneer Relic Home and Blacksmith Shop at 150 S. State. To schedule a tour, call Judith Jackson at 462-3760. So if you’re ready to get some twinkle in your house, permits to cut down your own Christmas tree are on sale now will be available until they sell out at the Manti La-Sal National Forest Sanpete District office at 540 N. Main Street in Ephraim. (Hours are 8 a.m. to 4:30 p.m.) Tags are $10 each; three per person. Permits will also be sold by Rasmussen Ace Hardware in Gunnison. For more information, call 283-4151.